This Christmas, there'll be no silent night. Not that I believed it at first. I mean…Birchardville. It sounded like the name of a small town in a book about a girl who moves from the big city to find love. Not that I read books like that. But in my experience, my listeners hardly ever sent hoaxes. I stood before the map above my desk, hunting for the right place to stick the pin. When I couldn’t immediately spot Birchardville, Pennsylvania, I resorted to an online search. 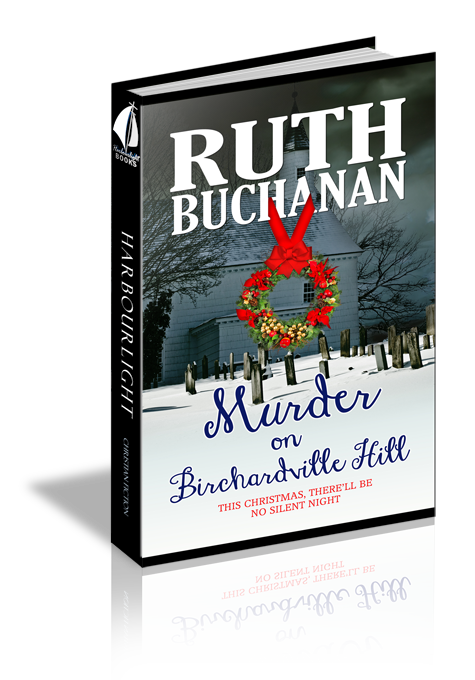 Even with the help of the Internet, I couldn’t confirm that Birchardville was an actual town, though I did find record of a Birchardville Cemetery near the quaint-sounding Cobb Hill Road. A quick zoom on the interactive map revealed a Birchardville Church and a Birchardville Hill Road. But the online map bore no flags to indicate points of interest: no restaurants, no gas stations, no libraries, no schools—nothing. Just gray space. I zoomed out to locate the nearest town and checked it against the postmark on the mailing envelope. Bingo. Although my name on the address label—Morgan Scott, c/o USUAL SUPECTS—had been penned in a flowing pseudo-calligraphy, the return address was printed in a tidy, boyish scrawl. And sure enough, it was postmarked from Montrose. I tossed the mailing envelope containing the fan-compiled case onto the crooked stack of papers next to my computer, making a mental note to dig into it over the weekend. Hopefully it would be interesting enough to distract me from the fact that I’d be spending the upcoming holidays alone. My computer pinged. I’d forgotten to close Vibe after I’d posted my update, and the comments and responses from the show’s fans were already rolling in. Not wanting to contemplate how many might be from Bev Pickett and her various accounts, I closed the page. I didn’t have to worry about Bev Pickett any more. Not really. That’s why I’d hired my assistant Leah. My crazy, middle-aged stalker wasn’t going to block herself. As much as I hated the nonstop Internet culture, connecting with fans kept the audience engaged. And an engaged audience bought books. Books that paid for my research trips and—ironically—helped me afford Leah. Hired only within the last few weeks on recommendation from a longtime friend, Leah Archer had already proven herself a Godsend. Working remotely from her home, she answered standard online questions when I was traveling or too busy writing episodes to interact online. She sorted my incoming e-mail, monitored ongoing cases, and forwarded me pertinent details. Most importantly, she agreed to sift the dregs of social media and send any suspicious activity on my account to my contact at the local cyber-crimes unit. Although we’re still in the honeymoon phase of her employment, I’m fully sold on the idea of a remote assistant. All the joys of less computer time with no forced social interaction. After closing Vibe, I padded to the kitchen, the slap of my flip-flops echoing against the high ceilings. On nights like these, I almost regretted the upgrade to a full-blown house. Ironic, considering how long I’d longed for a home of my own. But living in a house was different from what I’d expected. Instead of feeling independent, I felt isolated. Instead of enjoying privacy, I felt alone. Friends from church kept tabs on me, of course. They called and texted and sometimes stopped by. But it wasn’t the same as when Mom and Dad Scott had been alive. Writing and recording shows in the morning, lunch at noon, an afternoon dip in the pool, then research until dinner and a quiet walk in the dark before bed. This was my life now. I padded toward the kitchen. With every step, the slap of my flip-flops beat a mantra against the tile: a-lone, a-lone, a-lone, a-lone. I couldn’t bear the thought of another solo meal. Jogging back to the study, I nabbed the mailing envelope from the top of the stack. Perhaps the lure of a nineteenth-century Pennsylvania murder would pull me from my funk. Flipping the manila mailer onto the counter, I opened the rice cooker and lifted out the attachment, dumping the steamed vegetables into one bowl before scooping rice into another. I swiped a spoon from the dish rack and upended the packet, spilling paper and home-printed photos across the counter. Ten minutes later, I placed the spoon across the empty bowl, pulled my phone from my back pocket, and composed a quick text to Leah. I need you to book me a trip. Question 1: To what extent does Morgan contribute to her own loneliness? Answer 1: Answers will vary. Question 2: What does Morgan's decision to change her name tell you about her character? Answer 2: Answers will vary. Question 3: In what ways do the people of Birchardville subvert Morgan's expectations? Answer 3: Answers will vary. Question 4: How do Mom and Dad Scott demonstrate the truth of the Gospel? Answer 4: Answers will vary. Question 5: Why do you think Reed's mom doesn't like Morgan's show? Does the novel give you enough information to hazard a guess? Answer 5: Answers will vary. Question 6: Morgan spends some time pondering both having a father and being a father who kills his family. Do you think the circumstances of her youth has colored her understanding of family dynamics? Answer 6: Answers will vary. Question 7: How does the repetition of the quote from Betsy E.'s grave contribute to the mood? Answer 7: Answers will vary. Question 8: Birchardville is real. What would be some positive and negative aspects of living there? Answer 8: Answers will vary. Question 9: Which character would you most (or least) like to spend time with? Answer 9 Answers will vary. Question 10: In what way does the title of the book affect your expectations of the story? Answer 10: Answers will vary.